Often we end up having big images that needs to resized because we have to mail, upload, make them smaller to save hard disk space. Let’s just say we really do not need a something so big. What do we do then? *sign* can I have something very simple one step process to do to achieve this? We have lots of images editing tools available but those are not necessary because they are software’s that are big, some are trial version, for some we may have to pay. Its not worth taking so much pain for a such a simple task. Microsoft gives us a very small tool called Image Resizer download from Microsoft PowerToys for Windows XP. It’s a small 521Kb download. After u download and install it. Its really very easy to resize pictures. Example given below is a chat picture that is downloaded from Microsoft which is of the size 2(MB) Mega Bytes. 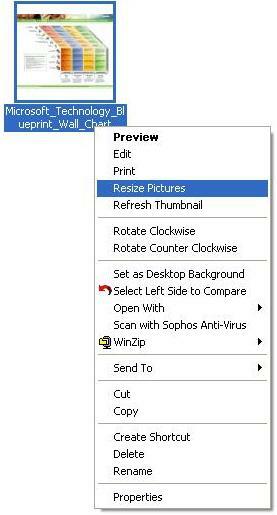 Click on resize, now choose the size of the image that you would like to resize. 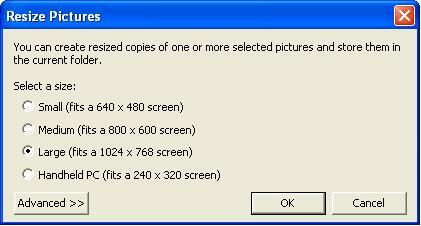 I am choosing standard 1024 x 768 size. Click on ok. Yes you are done. You have many size options in the list including custom option that works really well. You can also try an advanced option by clicking in the advanced button and the screen expands to show you new options. 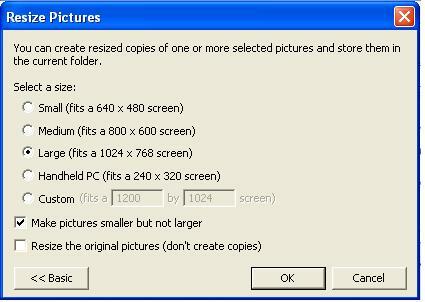 One useful option is “Resize original pictures, don’t create copies”. When you enable it the original picture resizes and does not create new copies.